Browse the current brochure, for our 2019 The Great Lakes Retreat. 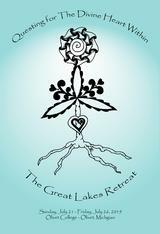 We invite you, seekers of all faiths, to gather for six days at The Great Lakes Retreat. Individuals with diverse experiences and beliefs come together to create a community of laughter, joy, and healing. A place where it is safe to explore and share who and what we are. Now is the time for you to gather with other loving people of similar interests in your quest for spiritual development and fellowship. Come, relax, and experience Questing for the Divine Heart Within, cover design by Dani Ehlenfeldt. 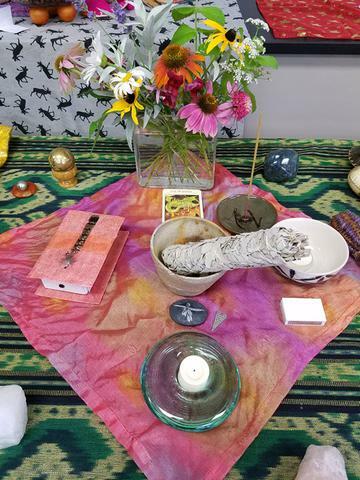 We are excited to offer you a week full of classes, lectures, workshops, meditations, healing experiences, and more. Check out some of our brochures from our previous retreats to see what sorts of other experiences we've had in the past!